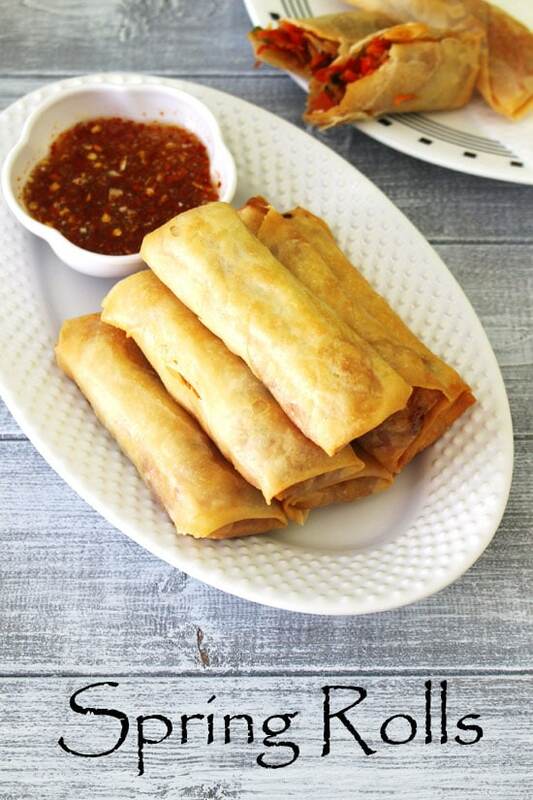 Veg Spring Rolls Recipe – One of the popular starter recipes from Indo Chinese cuisine. 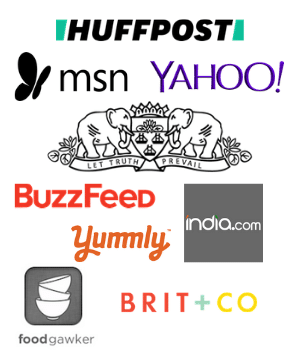 You will find them in every Indian chinese restaurant menu. 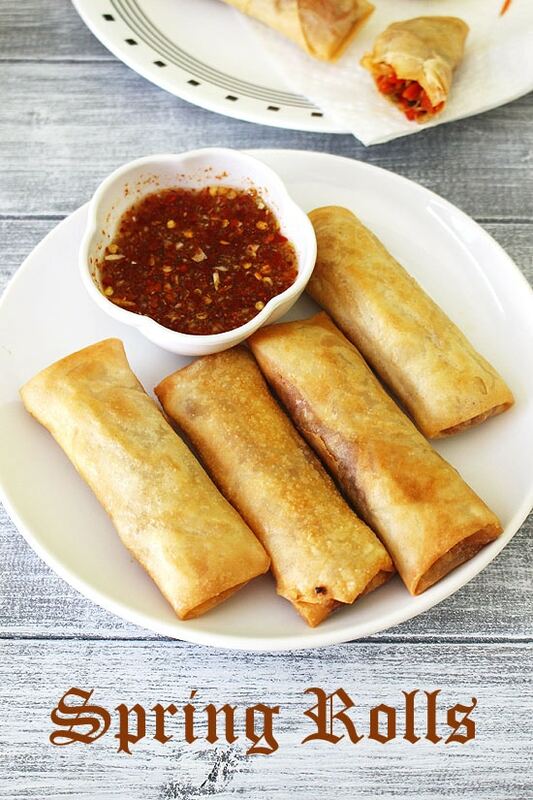 I have used store bought frozen wrappers to make these delicious, crispy spring rolls. It is easily available in the market. These sheets are so paper thin which give the perfect crispness and flaky texture. For the spring roll stuffing mixture, I have used mix of cabbage, onion, carrot and capsicum. You can add green beans, bean sprouts, mushrooms etc as per you preference. Many prefer to add some boiled noodles in the stuffing mixture. I have not added here. But addition of noodles sure makes it tasty. 1) To make spring rolls stuffing, heat the sesame oil in a pan on medium-high heat. Once hot add ginger, garlic and green chili. 2) Saute for few seconds, Do not burn them. 3) Add sliced onions and mix. 4) Cook till onions get light pink or translucent in color. 5) Then add cabbage, carrot, capsicum and beans if using. 6) Mix well and saute with stirring constantly for 3-4 minutes. 7) Then add spring onion greens. 8) Also add salt and pepper. Mix well. 11) And followed by tomato ketchup. 12) Mix everything well and cook for a minute. If using noodles, then add at this time and mix. Then turn off the stove. Let the mixture cool down. 13) Meantime, to make sealing paste take all purpose flour in a bowl. 14) Make smooth thick paste by adding water. Keep it aside. 15) Follow your wrappers packet instruction to remove individual wrapper. I am using frozen, so I have defrosted first, then covered with damp towel for few minutes. So every single wrapper comes out easily. 16) Now take wrapper on plate or work surface. Place around 2 tablespoons of stuffing at the corner as shown in photo. 18) and start rolling. Stop at halfway. 19) Now bring the sides into the center as shown one by one. 20) Now apply prepared paste on all the edges using fingers or brush. 21) Then roll and seal it properly. 22) Repeat the same for rest of the spring rolls. Keep them covered with towel while making, so they do not dry out. 23) When you are about to finish shaping, heat the oil on medium heat for deep frying. Once hot slide few rolls into hot oil. 24) When bottom side gets crispy and golden brown, flip them and fry other sides too. 25) Once fried from all the sides and the get golden brown color then remove it to a paper towel lined plate. Fry rest and serve them hot/warm. Serving suggestion: Serve veg spring rolls as a snack or starter with your choice of dipping sauce e.g. schezwan sauce, chilli garlic sauce or sweet chilli sauce. Heat the sesame oil in a pan on medium-high heat. Once hot fry ginger, garlic and green chili for few seconds. Then add sliced onions cook till they get light pink or translucent. Then add the veggies (cabbage, capsicum, carrot, beans) and saute for 3-4 minutes with stirring constantly. Now add spring onion greens, salt and pepper. Stir to combine. Then add soy sauce, chili sauce and ketchup. Stir well and cook for a minute. If using noodles then add now and mix. Turn off the stove. Let the mixture cool down. Make smooth, thick paste using all purpose flour and water. Keep it aside, we will use that to seal the rolls. Check your wrapper packet’s instructions to separate the sheets. Keep them covered with damp towel for few minutes for easy separation of the sheets. Take one sheet, put around 2 tablespoons of mixture at the end of one edge and roll then as shown in step by step photos. Do use the paste to seal them properly. Keep shaping them and keep them on a plate. Cover it with the towel to prevent them drying. Heat the oil for frying on medium heat. Once hot fry few rolls at a time till they are crispy and golden brown from all the sides. Remove them to paper towel lined plate and serve hot or warm with your choice of dipping sauce. I got mine from indian grocery stores. Can these made using an air fryer? Trying to cut down on the fat and frying.